66 MMS November 2017 mmsonline.com CNC TECH TALK Columnist Decisions made in your CNC environment must reflect your company's needs, and to make wise decisions, you must understand factors that con- tribute to your company's identity. The most impor- tant factor is company type, which I have addressed in previous columns. To review, here are the four types of companies that use CNC machine tools: 1. Product-producing companies. Revenue comes from the sale of products. 2. 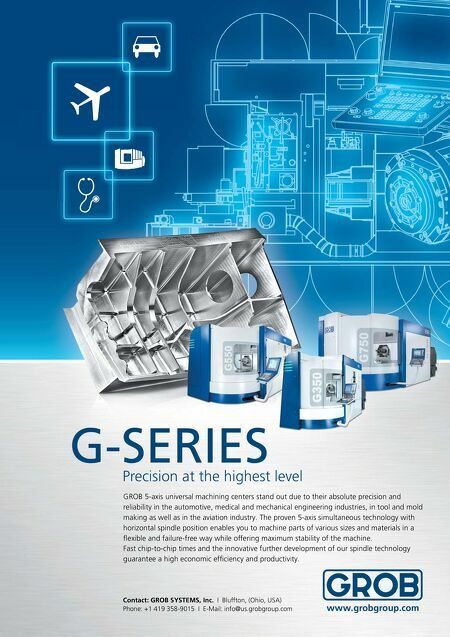 Workpiece-producing companies (job/ contract shops). Revenue comes from the sale of component workpieces to product-producing companies. 3. Tooling-producing companies. Revenue comes from the sale of support tooling (fixtures, gages, cutting tools) to product- and workpiece- producing companies. 4. Prototype producing companies. Rev- enue comes from the sale of prototypes to product- producing companies. Some important generalizations can be made based on company type alone, including shops' tendencies to repeatedly run the same jobs on their CNC machines and how often they run these repeat jobs. The more often a job is run/repeated, the easier it is to justif y costs associated with making improvements. Product-producing companies tend to have the most repeated jobs. Indeed, these companies tend to run the same jobs over and over. In addi- tion, it is not unusual for product-producing companies to have lengthy and predictable lead times, meaning they often schedule jobs to run on CNC machines well in advance. For example, a quantity of 500 of a given workpiece may be required in the assembly department every month; the schedule is made accordingly. Everyone who works in this kind of CNC environment knows the schedule and can prepare for upcoming times when the job will be run. 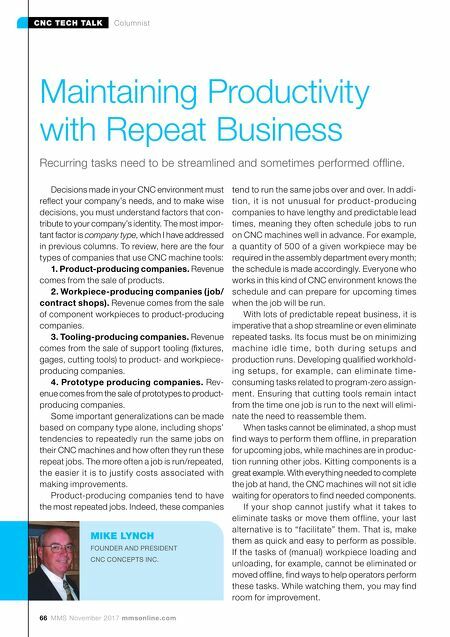 With lots of predictable repeat business, it is imperative that a shop streamline or even eliminate repeated tasks. Its focus must be on minimizing m a c h i n e i d l e ti m e, b oth d u r i n g s e tu p s a n d production runs. Developing qualified workhold- ing setups, for example, can eliminate time- consuming tasks related to program-zero assign- ment. Ensuring that cutting tools remain intact from the time one job is run to the next will elimi- nate the need to reassemble them. When tasks cannot be eliminated, a shop must find ways to perform them offline, in preparation for upcoming jobs, while machines are in produc- tion running other jobs. Kitting components is a great example. With everything needed to complete the job at hand, the CNC machines will not sit idle waiting for operators to find needed components. If your shop cannot justif y what it takes to eliminate tasks or move them offline, your last alternative is to "facilitate" them. That is, make them as quick and easy to perform as possible. If the tasks of (manual) workpiece loading and unloading, for example, cannot be eliminated or moved offline, find ways to help operators perform these tasks. While watching them, you may find room for improvement. Maintaining Productivity with Repeat Business Recurring tasks need to be streamlined and sometimes performed offline. MIKE LYNCH FOUNDER AND PRESIDENT CNC CONCEPTS INC.